Going Over the Edge – Kathy J. Marshack, Ph.D.
Information on how to have a successful relationship with your autistic spouse! Delve into the dramatic impact autism spectrum disorder can have on the complex world of adult interpersonal relationships. 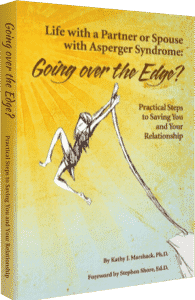 In Life With a Partner or Spouse With Asperger Syndrome: Going Over the Edge? Practical Steps to Saving You and Your Relationship, psychologist Kathy Marshack shares poignant true stories based on her own life and the lives of her clients, focusing on how partners/spouses of someone with ASD can find true meaning and happiness. The author discusses sensitive issues and shows readers how to take control of their lives, avoid or grow away from dysfunctional behavior and dysfunctional relationships, and create a successful relationship with their spouse on the spectrum. Each chapter closes with a series of Lessons Learned that recap the main points of the chapter and offer new ways to look at these very unique challenges. Foreword by Stephen Shore, EdD. To receive a complementary copy of a chapter from Going Over the Edge, subscribe to our newsletter below. We’ll give you instructions to get your free download.